The Yext Dashboard is a one-stop destination to manage online reputation and advertising services. The Yext Dashboard contains a real-time feed that shows the constant flow of reviews, tweets, Facebook wall posts, alerts and other information, allowing business owners to monitor and manage how their reputation is being affected in real-time. The Yext Dashboard also allows third–party providers to develop tools and services that integrate into the Yext Dashboard and feed. Like other comparable products SMBs can see where there listings appear and where they do not — and go right to those sites to update, add or correct them. The “Ads” view will hypothetically show ads from any third party site, but will also show “calls” (recordings/transcripts) from Yext. Yext hopes that it will boost advertiser adoption of Yext but CEO Howard Lerman also said that he hopes others, including Yext competitors, will write apps that can appear in this dashboard. Many reputation management products now in the market, including Marchex, Yellowbot and Steprep, among others, are being sold directly or bundled as part of premium packages. The Yext Dashboard is free. I’ve had three calls in the past 72 hours with companies offering reputation and/or presence management products for SMBs. It’s very clear to me that reputation management and related services are quickly becoming a mandatory part of the SMB offering. Google, to my knowledge, has always allowed phone numbers to appear in AdWords ad copy. But this has not been a widely employed practice. Or maybe at one point it was allowed and then later disallowed; I’m not sure. I’m going to speculate that these are tracking numbers (from Google) and that it is a PPCall billing model. The logic behind my speculation is simple. If people see the ads and just call the phone number there’s no click and so no billable event. Google doesn’t get paid. And the presence of the phone number in the ad in fact explicitly contemplates that some number of people will just pick up the phone and not click. To determine the efficacy of this program calls would necessarily need to be tracked with unique phone numbers. And Google probably wouldn’t say: just go ahead advertiser and use your own phone numbers and let us know later how many calls you receive. So Google is probably supplying the tracking numbers; and the model is probably PPCall. Agree? Disagree? What do you think is going on? The following is a piece by Bill Dinan, President of Telmetrics, about Google’s recent expansion of its Click to Call mobile advertising program and its potential larger significance in the market. The opinions are solely those of the author . . . While search monetization for Google has always been about clicks and measuring online activity, this move validates the complementary relationship between online search and offline consumer purchasing behavior. Online drives offline, so clicks and calls go hand in hand. Add mobile to the equation and Google recognizes a revenue opportunity in tracking the connection between mobile searching and the resulting calls. Advertisers benefit because they get a more complete view of the response generated by a mobile advertising program. But Google’s approach is different–other providers’ monetization models price calls separately and typically higher than clicks. You have to wonder why Google has come out with a lower price for calls, when industry experience demonstrates calls can be monetized at higher levels than clicks. Our guess is that they wanted to keep the mobile model simple for advertisers that are already comfortable with paying for clicks while still developing a revenue stream that accounts for the offline connection. 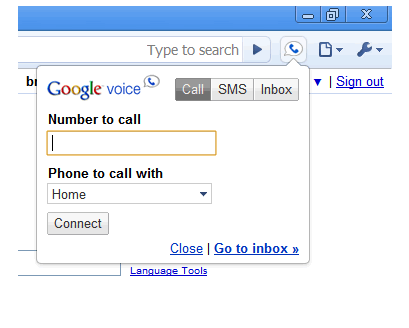 Does Google’s move into click-to-call hurt other online properties offering pay per call solutions? No, because Google’s move is consistent with their click-based model. Google’s model is not pay per call – it is a complementary model on the mobile device but it is still pay per click. Click-to-call doesn’t automatically translate to pay per call. However, Google’s move reinforces the need to track consumer online-offline searching and buying patterns. Have national advertisers showed interest in mobile click-to-call or pay per call ads? National advertisers have showed interest in mobile advertising, but more importantly they are looking for more transparency and performance-based advertising across all traditional and digital mediums to validate their ad spend. Click-to-call provides similar data to a click-based model and those advertisers already used to pay-per-click via Google will find that click-to-call is a natural extension and complementary. Those advertisers already using call-based metrics either through pay per call or subscription programs will still be looking for true call response data which by virtue of the information attached to calls provides richer data about consumer behavior. I met briefly with Yext at the Borrell show after months of emails back and forth. The company partly showed me and further described an elaborate and impressive calling platform directed at new customer acquisition exclusively. The company doesn’t currently offer a product for CRM or loyalty. All calls are recorded, analyzed and, then, merchants are only billed after the fact for good leads. Analysis of the calls is done with speech-to-text technology and data mining for various key words and phrases to determine caller intent. Traffic comes from syndication, SEM and Yext’s own directory. Yext participates in CityGrid for example. In terms of business models, it’s an interesting variation on PPCall that remedies some of the problems of the model. Conventional PPCall just looks at call duration to determine whether to bill. For example the old Ingenio (now operated/owned by AT&T) billed after 30 seconds. This product involves a great deal more sophistication to determine the actual content of calls as a prerequisite to billing. It pushes closer to a model that is more “risk free” for advertisers, though not as far as a HelpHive or LocalTop, which take a commission upon completion of a project. Yext also rewards merchants that respond to calls; answering the phone is a problem for some SMBs. Those that are responsive rank higher in results than those who do not (price is of course also factored in). I specifically asked about the $20M revenue figure floated during the recent TechCrunch event in which Yext had a bit of a coming out. Many people I speak with don’t believe that the company actually has those revenues. Not only are those revenues real, said CEO Howard Lerman, they’ll be bigger than the quoted figure this year. The strategic use of that number helped the company secure a $25 million round of funding. My belief is that if the revenues weren’t real the VCs (who presumably do due diligence) wouldn’t have invested. Correction: Ingenio charges for calls after 12 seconds not 30. 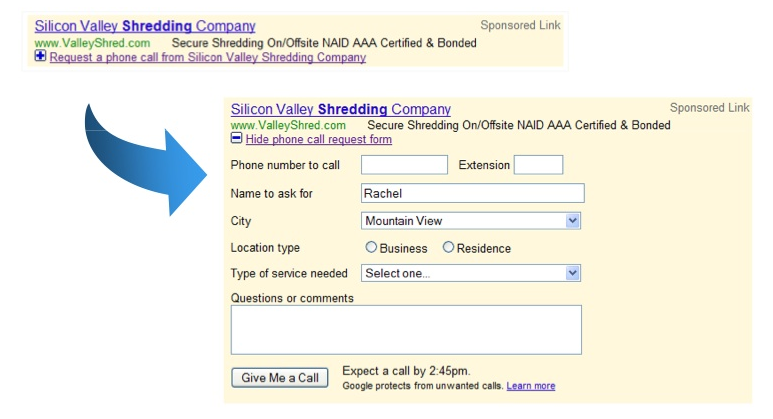 Google recently introduced PPCall/Click2Call in mobile and is obviously playing with lead-gen and other variations on its traditional CPC model. As I said in last month’s Search Engine Land column, the idea of call-tracking in Local Search is terrific. The fragmentation of the space and the ability to provide easy-to-understand, real metrics for small business owners should make call tracking a natural evolution in Local search marketing. It’s just not a good idea yet. In his response, Telmetrics president Bill Dinan strongly defended the use of call tracking, but personal experience with actual small businesses has left me unconvinced of his points. The local search ecosystem simply has not evolved as fast as Telmetrics’ (and other providers’) technology. First of all, I’m not sure this is true. There’s certainly a place for an 800-number in the submission process for Localeze and infoUSA/Acxiom/Universal Business Listing, but I’ve not seen the column in these submission areas for a secondary local tracking number. Perhaps there are special arrangements for providers as large as Telmetrics but my column was written from my perspective as the owner of a small SEO agency. 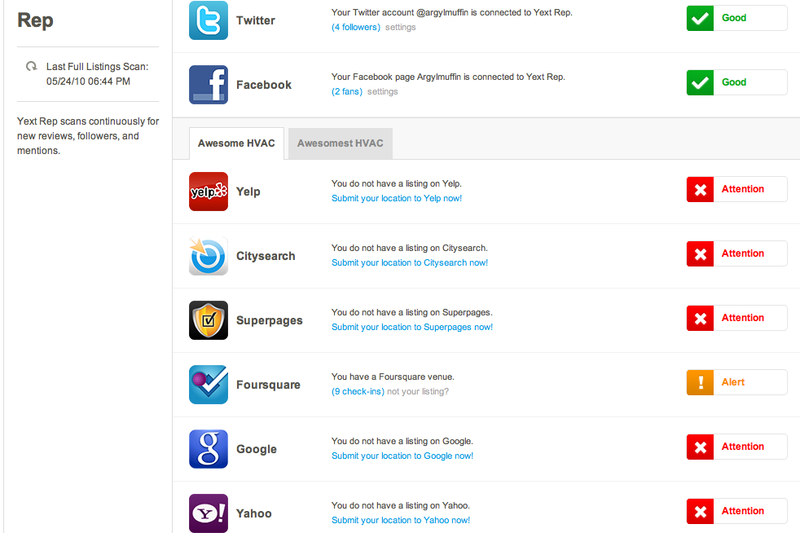 Secondly, and I think this is a key point, not all information in the Local ecosystem comes via a feed. Jonathan Cohn of Acxiom mentioned in August on a Search Marketing Now webinar (27:00 onwards) that YellowPages ads are “keyed and scanned every year” by Acxiom. 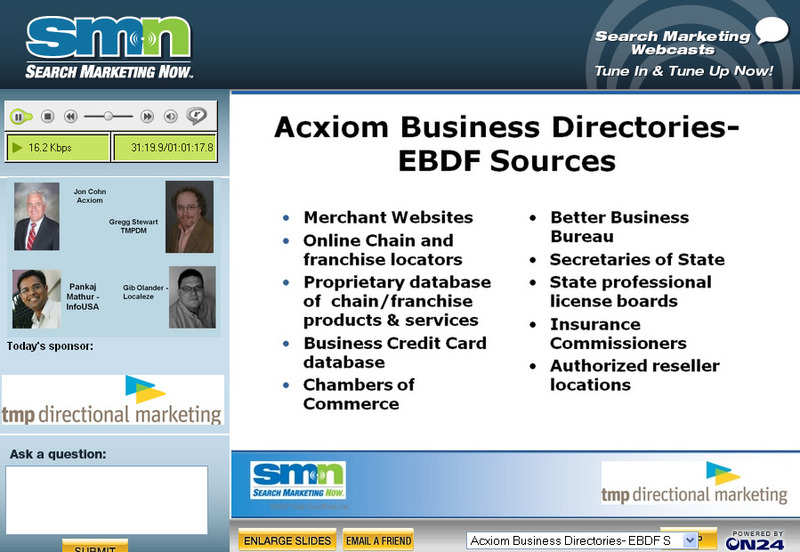 He also showed this slide showing even more places from which Acxiom pulls business data. From personal client experience—if you use a tracking number in the YellowPages, it’s highly likely to get picked up by Acxiom (or another aggregator) and into Google’s index as a unique listing. And every time Google gets a fresh data feed, I have to help clients who use tracking numbers claim and attempt to consolidate each of those call-tracked listings. It requires constant attention. In fact, just this month, a “new” listing popped into Google Maps for a friend whose website I helped with over the summer. Here is the search for his company in Tualatin, Oregon. Note that even though both listings contain the word “Creekside” in the business title and use the exact same address, Google Maps has not merged the two. Which, yes, is somewhat surprising—we’ve seen them merge with much less matching information in the past. The ecosystem is amazingly complex, and as Brent’s example proves, you just never know where one number is going to end up, or how long it’s going to stay there. Not only does this situation affect visibility in Google Maps, but it significantly undermines the granularity of analytics data that call tracking is supposed to provide. If a phone book number or an Internet Yellow Pages number is getting picked up by Google, the supposed volume of calls from those destinations is going to be exaggerated. Thus, consistency of business information throughout the Local ecosystem should still remain a best practice. Regardless of whether Google has explicitly confirmed that mentions of primary business information help with ranking in Google Maps, according to Google Maps’ patent, local search experts, and a quantitative study of Google Maps they do. Yes, the algorithm will continue to evolve and take into account richer data signals like link graph data, reviews, and other user-generated content. But for millions of small businesses without any website, or a poorly-optimized one, the phone number IS their identity. Phone numbers (and addresses) are as fundamental for Google Maps’ business index as the link graph is to its organic index. Google wants a direct representation of real-life business information, and a call-tracking number doesn’t satisfy that criterion. As to the notion of number recycling, I agree with Bill that it might not occur “often.” It sounds like Telmetrics tries to act in its clients’ best interests if they end their contract, but that doesn’t prevent less scrupulous companies from switching numbers instantly. It is a short-sighted strategy to counsel small business owners to “focus on what you can control, and that is paid advertising.” What happens when prices skyrocket or inventory becomes limited? Ignoring organic optimization and social media—neither of which you can control—is just as foolhardy as ignoring paid search options in a successful online campaign. Online-based call tracking is not the only method of tracking leads. As I pointed out in my original article, traditional offline methods like Excel spreadsheets and post-it notes can work just fine—and they do, for my clients for whom tracking is of central importance. Google tried a mortgage marketplace in the UK last year as a test drive for a range of things (Merchant Search). The theory at the time was that Google was trying to develop a separate marketplace for SMB advertisers. It then introduced (only in two markets so far) Local Listing Ads for SMBs (using call tracking with Google Voice). And now it’s launching AdWords Comparison Ads, starting with mortgages. Comparison Ads is part of our continuing effort to make ads more relevant and useful to our users and to help you, our advertisers, reach the people who are most interested in your products and services. AdWords uses a host of targeting and relevancy signals to determine the best ads for each query. However, sometimes a user’s query doesn’t provide enough information for us to confidently predict what they want. Take, for example, users who search for “mortgage.” Do they want a new home loan or a refinance? Do they want a fixed rate or an adjustable rate loan? Comparison Ads improves the ad experience on Google.com by letting users specify exactly what they are looking for and helping them quickly compare relevant offers side by side. With Comparison Ads, you can also target your offers at a more granular level, leading to more valuable, qualified leads. To see how it works, let’s use our mortgage example. Users searching for “mortgage” on Google.com may see a promotion from Comparison Ads prompting them to select the type of loan they are looking for and to compare various rates. Ads are sold on a cost-per-lead basis. When someone clicks to receive a quote, the advertiser is forwarded the information and billed. The advertiser also receives no personal information about the person. In fact, they don’t even get the person’s real phone number. Google provides a temporary bridging number that connects the advertiser to the customer. After that, it’s up to the customer to provide their own “real” number if they want follow-up, Fox said. Indeed, the model is cost-per-action or cost-per-lead. Google has had CPA ads for some time but these ads are slightly different in that they’re delivering one-to-one leads. Certainly I can contact multiple lenders but Google isn’t selling leads to multiple lenders as some CPA marketplaces do. And the bids/prices that sellers will pay will be significantly more than what they’d pay for a click. As mentioned this begins with mortgages but will grow and extend to other verticals and segments. Think ServiceMagic advertisers, auto dealers and so on. The lead-gen businesses based verticals out there might have reason for concern. What do you think? How do you think this will play out and what categories do you think Google will move into? The following is an unedited Q&A interview I conducted in email with Telmetrics president Bill Dinan about some of the issues raised in a recent article by David Mihm that ran on Search Engine Land (“Be Wary Of Call Tracking Numbers In Local Search“) about some of the potential SEO problems with call tracking. I invited him to respond to Mihm’s concerns and critique . . .
What happens if you give your business a unique tracking phone number at a directory that Acxiom happens to spider for its own index? That number is now considered authoritative by Acxiom, and gets pushed out to every partner that’s leasing Acxiom’s data. First, what’s your response? Is this a real issue or concern? How likely is the scenario Mihm describes? Dinan: The argument that using multiple local business phone numbers could pollute the local search engine distribution ecosystem is not valid. We do agree that the company should retain a main phone line in addition to their call tracking number to help validate the business content. Today, all of the Local Search feeds have room to accept both the main business number (aka Primary ID or PID) and the tracking number. Local listing aggregators and distribution companies are also accommodating both numbers – or are working feverishly to do so – as they are being offered a rev-share on the retail call price charged by the SEM or agency. The PID allows the distributors/aggregators to validate what disparate listing data belongs to an actual business. These progressive Pay-Per-Call advertising models are driving the distribution chain to adopt call tracking and analytics and are attractive to national advertisers, agencies, and SMBs that want to see the value their local search program is delivering. Being a part of the ecosystem means proving value which requires tracking the leads. 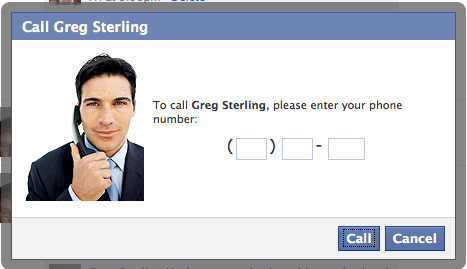 Sterling: Is it true that call-tracking numbers are often “recycled”? So a number used by for one business in January might be used to track calls to another local business in September? Dinan: No – “often” is an overstatement. Recycling numbers is not a best practice, however, when it is required due to other campaign parameters, there are basic quality control processes call tracking providers, publishers and advertisers should use to ensure the line has not received any calls in a 90-180 day period. Sterling: How can one use call tracking and avoid “confusing” the search engines (as in Mihm’s example) and third parties who might rely on such data? If you decide that the benefits to call-tracking outweigh the possible risks to your rankings, at the very least ask if the marketing company or search portal with whom you’re engaging can hide these numbers when they display them to search engines. But I doubt that many companies that are providing call-tracking numbers in local search have considered their implications for ranking, so most are probably hard-coding them at present. How would you respond to his suggestion in the paragraph above? What do you think of the viability of this approach? Dinan: Hiding phone numbers or requiring searchers to click a button to see the phone number is not a new concept, however, it delivers a poor customer experience that has a dramatic negative affect on impression-to-call, and/or click-to-call ratios. So even if you are ranking favorably on Google Local … your call ratios just fell through the floor. Conversely, call tracking using java script technology is getting better and better, and will be deployed more. While Google reads java script, it does not save it in the index. This technology, Dynamic Number Insertion, is used to track calls by distribution source and/or even to the keyword level. It is a technology that will continue to morph and would be a great tool for SEO companies to use. It would address any potential risks to rankings, and enable SEO companies to clearly and objectively demonstrate the value being provided to advertisers in the Local Search arena. Sterling: In some situations, directory publishers and local search sites may be using call tracking without the knowledge of the business owner (to prove value at renewal time). How common is this practice and what do you think of this “involuntary call tracking”? Dinan: This is not a common practice. In speaking with thousands of SMBs, hundreds of agencies, and hundreds of national advertisers, they see the value of call tracking lines and advertising performance analytics. Sterling: What “best practice” recommendations would you make to use call tracking but avoid any negative potential SEO consequences? Dinan: The article has an issue with the possible (not proven or confirmed by Google) affect on listing ranking (SEO) within Google Local 10 Pack. What’s more important to an SMB? Finding out which advertising is producing the highest value calls … or ensuring that the best possible local search rankings? Even if you have the best possible ranking today, can you depend on that to have sustainability tomorrow? What happens when Google flips the algorithm again? You may be starting over. SEO rankings are significantly more dependent on keyword content, quality score to ads, and quality link associations than varying phone numbers. Focus on what you can control, and that is paid advertising. Yes, organic rankings and the related leads should be a piece of your marketing efforts that blend/cost-average with your paid search campaigns, but not something that you should do without a tool to prove value. Sterling: Google acknowledged on its Q3 earnings call that it was using Google Voice numbers to do call tracking for its Local Listings Ads. What do you think about this? Do you think there’s any “double standard” given the SEO issues Mihm identifies? How many customers did you drive to me? How effective was my media spend in driving quality calls? What was the quality of the calls? Which advertising mediums worked best for me? With several years in the call measurement space serving Yellow Page publishers, I concur that Print YPs deliver leads and should not be afraid to report them. However, the difference in the data – average call length of IYP (1.3 mins) vs PYP (2.7 mins) – strikes me as unusually high. I look at the Telmetics data above and I do not see the superior quality of PYP leads and an argument for pay-per-call, I see a fundamental issue with IYP call tracking and an opportunity to solve the challenge revealed within the data: Why are IYP leads 50% in quality compared to PYP leads? Rosen’s full post is here. I guess presenting at the recent TechCrunch conference was a big win for Yext, to the tune of $25 million. Reportedly the money will be used to hire sales people and expand the range of categories that Yext is going after. Any direct sales effort to the SMB market is dicey but Yext claimed at the show to be on track for $20 million in revenue this year. It’s not entirely clear to me how they’ve reached that revenue level without a brand and much visibility in the market, but I’ll find out. Telmetrics President Bill Dinan argued (at the Kelsey show) that yellow pages publishers should shift the print directory to an entirely performance-based model, specifically PPCall. The call-tracking company released data from its aggregated customer records to argue that the industry needs to adopt a performance-based pricing model for the traditional printed directory to be more competitive with online. Even though there are many PPCall experiments and efforts going on it print, it would be a radical move to go totally PPCall. Do you think that print revenues would hold up? What categories would grow revenues, which ones might fall? Calls would need to be priced differently by category and territory or geography. An auction would take care of that and be self-regulating, but would probably be too complex for the bulk of YP advertisers. 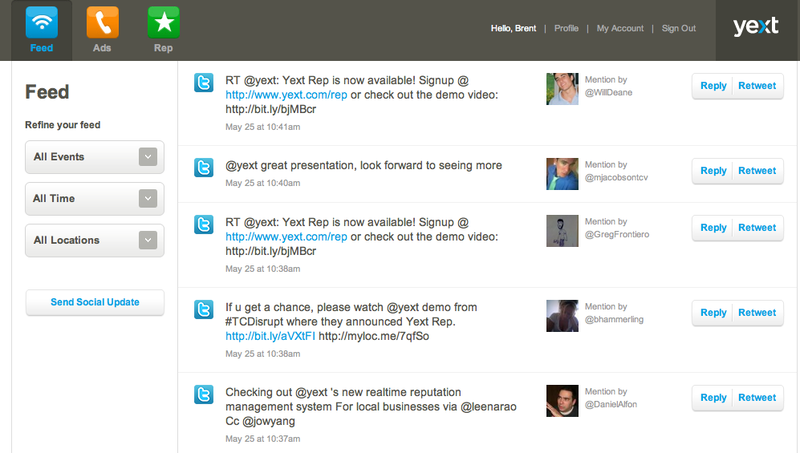 I finally watched the Yext demo from TechCrunch50. The technology (identification and transcription of relevant keywords w/in calls) was impressive. The company has been around (originally as Alpha411) since 2008 and is changing from a PPCall model to a “pay per action” calls model (a subset of calls received). 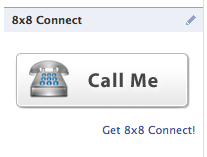 The critique Yext offers of PPCall online is valid (spam calls get through, not enough volume). So now it’s only sending a subset of calls to advertisers, who can see transcripts and presumably listen to recordings of those calls. Irrelevant calls wind up in a spam folder but can also be examined if desired. Only “awesome” calls (leads) are billed to local merchants. Indeed, the word awesome is overused in the demo. The company says that it already has 20K advertisers is generating $20 million in top-line revenue. The call volumes are apparently generated through IYP distribution partnerships and via Google SEM (on behalf of Yext itself). The company doesn’t resell SEM to local advertisers. However they employ the same pitch to SMBs: we’ll be your onramp to the broader Internet. 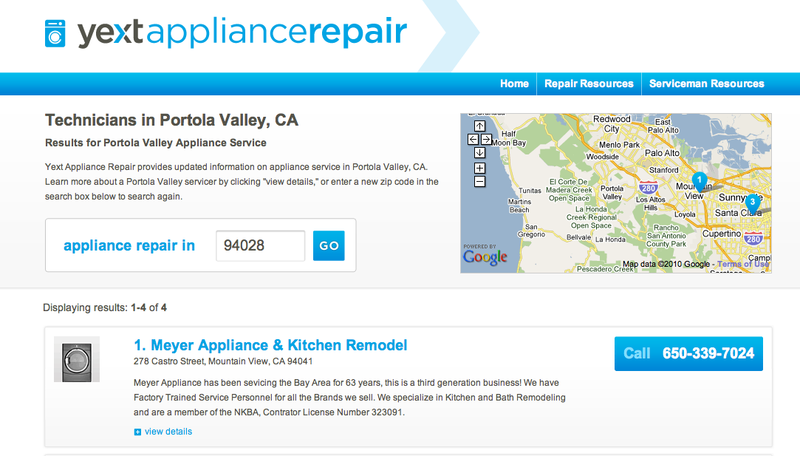 Listed partners include YellowPages.com, Local.com, Topix. The best question of the follow up panel segment was asked by Google’s Marissa Mayer who wondered about Yext as an IT platform vs. an advertising platform with a consumer aspect. She was suggesting that the company should offer its services to others who in turn sell to SMBs. She also pointed out correctly that the “core innovation” Yext appears to have developed is the merchant calls in-box and the related categorization and analysis of calls. It seems that despite the startup label Yext is already a success (if the revenue and merchant numbers are true). The simple math indicates advertisers are paying on average $1k annually for the service. Yext will probably eventually be acquired, as Mayer suggested, for its platform capabilities. This is largely what happened with Ingenio and AT&T. That acquisition was reportedly north of $300 million, but Ingenio also had a big revenue generating business in Keen, which drove the overall price up. Some of the comments on my earlier RedBeacon posts suggest that a winning combination would be a “mashup” of that site with Yext.